Ford has showed the Mondeo Vignale concept for the first time, and stated its aim to capture buyers of premium badged cars, when it goes into production in 2015. Vignale will be more than just a trim level because it will also be backed up by special dealer and customer services. Ford Vignales will take the role reserved in the past for Ghia and Titanium at the top of the range. The company promises that these cars will appeal to buyers looking for luxury in their family cars who would not necessarily consider Ford. Although full details are yet to be released, Ford promises that Vignale customers will have their own personal concierge within the dealership, which will possibly also extend to other services such as airport check-ins and appointment management. But for now, the concept gives us a great idea of how the production Vignales will look. In the Mondeo concept, the cabin is trimmed in quilted, soft touch leather with plenty of brushed aluminium and chrome details. The emphasis is on tasteful trim colours and materials, which have been especially selected to appeal to buyers in the luxury sector. The exterior styling has not been left untouched, and the Mondeo concept has Vignale styling details, such as chrome-finished 20-inch alloy wheels, upscale badging (without the word Mondeo to be seen anywhere), and an interesting new eggcate-style grille. Technology features, too – the Mondeo Vignale has adaptive LED headlights to reduce glare and improve night time visibility and there’s Ford SYNC for connecting mobile phones and music devices. 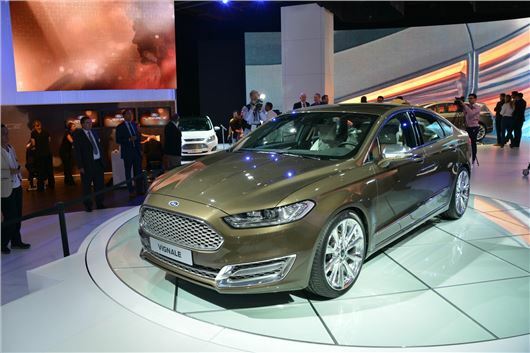 The first Vignale model is to be the Mondeo, which has been shown in both saloon and estate form, but the badge will be applied to other cars in Ford’s range later. It’ll be 2015 before the Mondeo and other Vignale variations arrives in showrooms so it’s tricky to speculate how much it’s likely to cost but expect it to be the most expensive Mondeo in the range, with prices to compete with executive cars like the BMW 3 Series.